Ever wondered which commercial battery actually does last the longest? The ADC-16 is an ideal tool for answering this question. A load resistor for each battery. In order to discharge a battery it has to be subjected to a load. The size of the load will determine how fast the battery discharges. When selecting the load, it has to be taken into account how long the experiment can be left running. where V is the battery voltage and I the current from the battery. The current must first be derived, by taking a duration time for the experiment, e g. if the experiment is to last 20 hours, and the battery with the largest capacity is rated at 2700 mAh, then the current per hour will be 135 mA (2700 mA / 20 hours). These calculations can only be used as a rough estimate as the battery voltage will be changing constantly as it discharges. In this example Rload is taken to be 10 ohms. A 10 ohm load resistor is soldered in positions P1, P2, P3, P4 and P5 on the terminal board. Batteries, in holders, are then connected to channels 1 to 5. The PicoLog recorder program is setup to monitor and record the batteries as they discharge. Real time continuous recording mode is selected as data is being collected at a low sample rate, just once per minute. 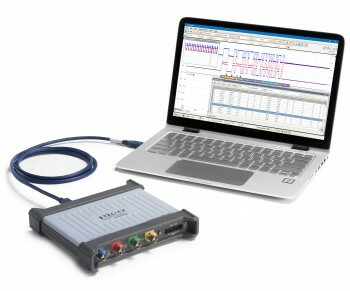 (PicoLog can record at up to 10 samples per second in this mode). Each channel is given the name of the appropriate battery. Once setup is complete the monitor displays readings in mV of all five channels. The record button is pressed and the data logging experiment begins. The battery discharge can be viewed in either graph format or as a spreadsheet as the ADC-16 collects the data.